Animals Barbuda Birds Faroe Islands Bird stamps from Barbuda. Barbuda is an island in the Eastern Caribbean, and forms part of the state of Antigua and Barbuda. It has a population of about 1,638 (at the 2011 Census), most of whom live in the town of Codrington. 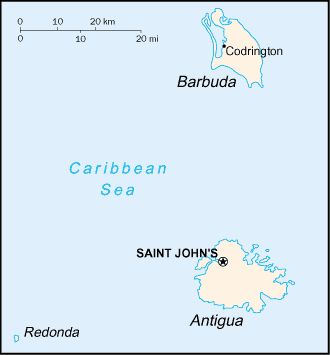 Barbuda is located north of Antigua, in the middle of the Leeward Islands. To the south are the islands of Montserrat and Guadeloupe, and to the west and north west are Nevis, St. Kitts, St. Barts, and St. Martin. Barbuda is home to the Frigate Bird Sanctuary, which is located in the Codrington Lagoon. Other points of interest include Highland House (the 18th century home of the Codrington family) and the Indian Cave, which contains ancient Amerindian petroglyphs.